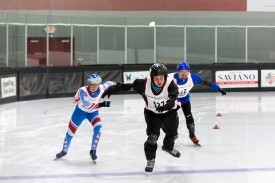 Speed skaters and figure skaters were enthralling their audiences in February – not only in Sochi, but at the inaugural Special Olympics Illinois Skating Championships Feb. 19-20 at Canlan Ice Sports in Romeoville. It was a change for the seasoned Illinois skaters who were used to competing in Dubuque, Iowa, as part of the annual State Winter Games in Galena. “Canlan is closer to home and we don’t have to worry as much about cancellations due to bad weather,” said one coach. Athlete Judith Rich-Smith of Pekin interviewed her fellow skaters about their thoughts of the new facility. Read her report. Canlan Ice Sports has three rinks at its facility which enabled the speed skaters to compete on one rink at the same time the figure skaters were competing on a second rink. Figure skaters like Erin Hart, who traveled the furthest, from Pleasant Hill near Quincy, performed a short program on Wednesday and a longer freestyle program on Thursday, with judges calculating the scores. 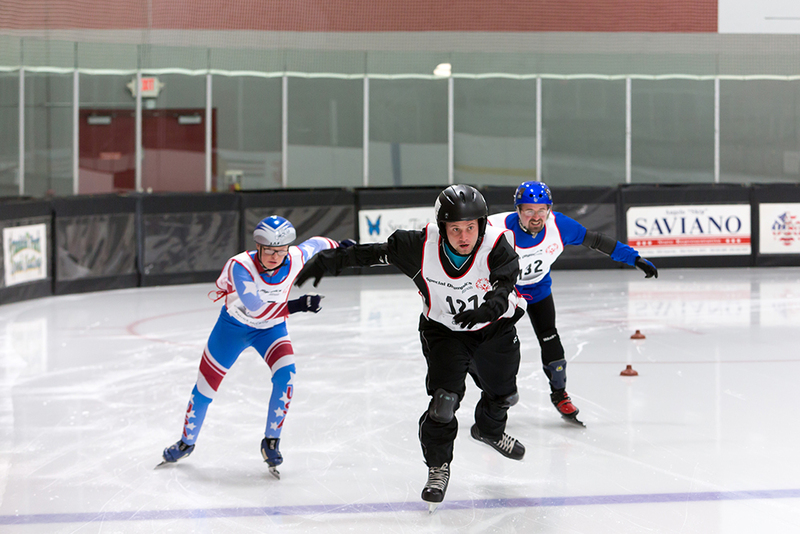 Speed skaters were able to compete in races ranging from 111 meters to 1,000 meters. Medals and ribbons were presented on Thursday, following the competition. On Wednesday night, athletes enjoyed dinner and a dance at the Holiday Inn in Bolingbrook. At the same time, family members and coaches provided feedback in a sports forum about the event and about how to grow participation in both sports. It was an opportunity for them to express what they liked and didn’t like about the change in venue and for brainstorming about viable methods to promote skating. 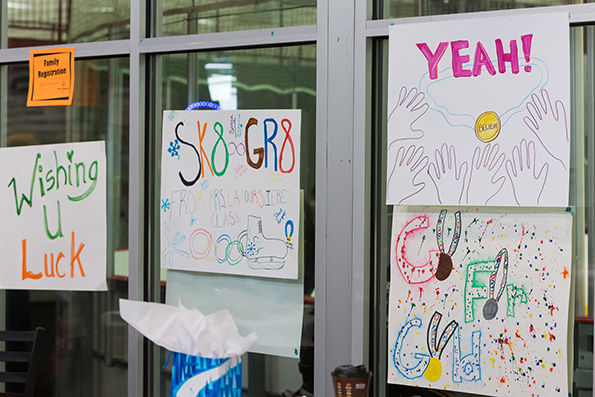 “We also had a chance to hear some great ideas about how the non-competitive aspects of the two-day event could be changed or improved for next year, so athletes have the best possible experience both on and off the ice,” said Hilliard. 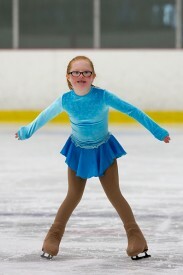 When Alyssa Dunn, 12, a student at Crone Middle School in Naperville and a figure skater, learned that the Skating Championships would be held on her home ice, she began encouraging others to make posters to cheer on the Special Olympics skaters. “I talked to my brother’s fourth-grade class and the teacher loved the Fans in the Stands idea. She thought it would be a great field trip,” said Alyssa. “I explained to them how hard of a sport skating is and that we all share the same ice every day. It’s a sport we all fall in, and fall hard, and we all share the love of it even though it is hard to do. People were really happy to make posters. Alyssa hopes to cheer on the athletes next year with more posters and would encourage more students to attend the championships as Fans in the Stands.